Tom Davies: Photo: Jane BywaterOn 26th July 2016, Bangor University Alumnus, Tom Davies left his home in Presteigne. Nine weeks later he arrived home, having walked the 1,100-mile perimeter of Wales, raising £6,700 for Alzheimer`s Society. Now his newly published book, A Welsh Wander – An Epic Trek Right Around Wales, is his heart-warmingly open and honest story, bursting with facts about places along his route. With vivid descriptions and photos of stunning scenery on the Offa`s Dyke Path and Wales Coast Path, Tom describes magical wildlife encounters, bizarre anecdotes, random and life-reaffirming generosity from strangers, and even a few dark moments when he felt like he’d bitten off more than he could chew. It was for this reason that Tom had the idea for his challenge – to circumnavigate his home country in one go, carrying everything he needed to survive in his loyal backpack, Wilson,. 1,100 miles, two months away from home, a £1,100 sponsorship target and a daily online blog called Tom’s Welsh Wander that would become far bigger than he ever dreamed possible. Tom’s blog hits eventually climbed to over a staggering 26,500 and his fundraising reached a total of £6,700 – well above his original £1100 target. 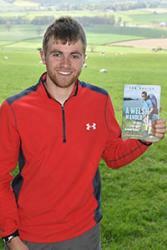 His journey also drew the support of one famous follower, TV presenter and Welsh meterologist Derek Brockway. Tom Davies grew up in a close farming family in Presteigne, developing a love for nature and the great outdoors. While at Bangor University studying Primary Education, he joined the Mountain Walking Club, becoming treasurer and a leader, and spent most weekends taking groups into Snowdonia. After graduating, he spent four years teaching. He is now combining his love for teaching and the great outdoors by working as an outdoor activities instructor. The book will be launched in Presteigne in late June in the company of Tom Davies and Derek Brockway.